Merlin’s home town of Chorley is set to host the opening round of British Cycling’s Elite Road Series. In fact, the race is set to pretty much pass by our front door. 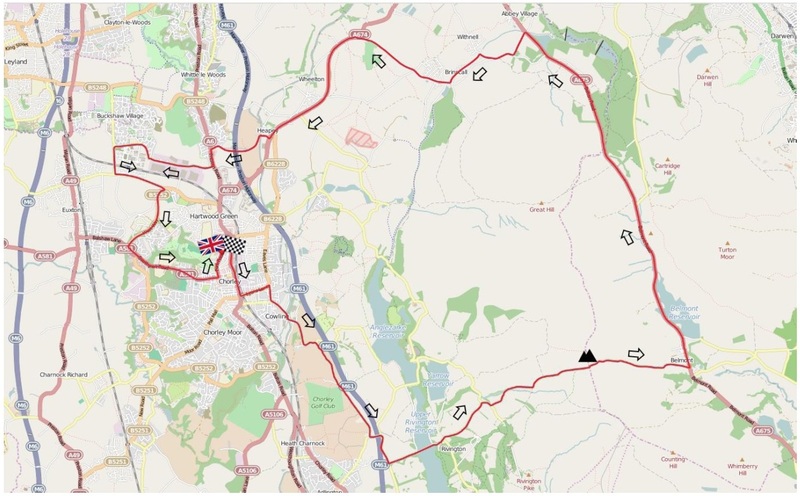 On Saturday April 4th at 11am round 1 of the Elite Road Series will kick off along Park Road in Chorley before heading out to take in Rivington, Belmont, Abbey Village, Withnell, Brinscall, Wheelton and Buckshaw Village (top left of the route map below, home of Merlin Cycles). The finish line will be located along Park Road at the point where Millfield Road meets it. The podium is going to be placed in the entrance to Astley Park. Although this is only a 23 mile route, the riders will do a total of five laps, making the full race distance 116 miles (186km). There’ll be rolling road closures in effect. The organisers claim that it will be tough race. It will be extra tough as it’s the first proper race of the season for most of the pro’s riding. It’ll be interesting to see whose training has worked and whose hasn’t. British Cycling’s Jonny Clay, said: “The region has a proud cycle sport history and I’m very hopeful that the Chorley Grand Prix could lead the way to the creation of a Tour of Lancashire in future seasons. However, for now I am simply excited about 2015 and the racing that is going to take place. “Over half a million viewers watched or read about this year’s events while tens of thousands more gathered at the roadside as events unfolded live. We’re not sure if it’s confirmed yet but the race should be appearing on Eurosport. Watch this space (or better yet, Eurosport). The winner of the 2014 Elite Road Series, Yanto Barker, said: “The atmosphere on the roadside was incredible throughout 2014 and it is great to see the series mapped out for 2015. The obvious places to watch the race are the start and finish points but they’ll be packed out and arguably may not be that interesting or rewarding. The start will be neutralised anyway for the first 4km. Getting over to Rivington or better yet up to the King Of The Mountain point on the road up at Belmont will be nice spots. And let’s not forget Buckshaw Village. It’s where we’re based (which is obviously reason enough to base your spectating there!) but the open and fast roadways down into the middle will afford a great, open view of the pack and the leaders. You’ll have to be pretty darn good and have a license etc. Entry is £30.00 via the British Cycling site for 1st, 2nd and Elite category racers. The Elite Road Series is pretty much The Star Cup that dates back to 1959. It changed its name to the ‘Premier Calendar’ in 1993 and then recently to the ‘Elite Road Series’. The series has been won by such names as Paul Sherwen, Hugh Porter (yes, the annoying commentator), John Perks and Russell Downing. Tagged british cycling, buckshaw village, chorley, elite road series, racing, star cup. Bookmark the permalink.